An ordinary man, a former police researcher, is on a quest to expose the person who killed his sister. His world changes when he discovers he can hear and see the Celestial Spheres which seem as political and as incompetent as any large organization. But when god is contemplating a “restart” to the human experiment, this man and his strangely connected girlfriend become humanity last hope. Will this ordinary man and his girlfriend be able to save humanity? To find out, Benjamin Gilad, the mind behind ‘There Will Be Hell To Pay’, has kindly joined me today to explore the world of the Celestial Spheres. Benjamin, let’s set the stage of Celestial Spheres, with how it all began. Looking back, what thoughts inspired you to write this novel? That’s an interesting concept, and one that I feel has evolved from experiences from in your own life, correct? Yes. I lost my sister to cancer when she was 36 only. I still miss her. She “lives” in my memory every day. When I die, she’ll die with me. I’m sorry to hear about your sister. I won’t ask if she appears in this story as it might give the plot away, but were the other characters inspired by people you’ve met in your life? The book is about a libertarian police researcher – well, I am a libertarian, former police detective. The investigative techniques used in the book are based on real life. The protagonist is also an economist by education who believes populist/radical Left wing policies are a sign of insanity or corruption. I am a former economics professor who can actually explain why. As someone who can explain, can you explain what’s the most important ideas that you wanted these characters to share with the readers during their journey? That taking responsibility for our choices and actions is the foundation of morality. Also, that a sense of the absurd is a wonderful quality I hope my readers posses. Oh, I hope so too! We’ll get back to the absurd a little bit later, but before that can you share what goes in on your mind to develop this sense of absurd in your writing? What do you think about as you write? Unfolding the plot while I write. Letting the character carry me. How has your voice as an author changed as you’ve allowed yourself to be carried away by the characters? I’ve become more cynical and more emotional and more rational and more absurdist. See some contradictions there? Good. So, what have you learnt by challenging your contradictions and getting this story onto paper and into the hands of readers? That when you write fiction you get consumed. I have 6 non-fiction books out but none took me in like that. Six non-fiction books alone are fantastic writing effort! Would you say you’re an energised writer, or does it get exhausting at times? Both, but mostly energize. It’s better than coffee. Better than coffee? Is that why you write? I write because it is tremendously satisfying. So, if it’s better than coffee, I’m sure you have an awesome project on the go. What awesomeness are you currently creating? The sequel to this Celestial Wars series. Also, a non-fiction book about Corporate absurdities. Oh, there so much absurd in the corporate world that I think you could have at least another six books there alone! That probably isn’t enough to contain all of the absurdity, so let’s get some of the absurd out in the open by trying a few of our quirkier questions, some of which you’ve contributed to today. So let’s get the fun moving with the question, if money doesn’t grow on trees then why do banks have branches? The one who placed the filter. I’d like to meet him. But first, have you ever been on a literary pilgrimage? No. I am the President of two companies. Not much time for pilgrimage or writers conferences or creative workshops. So, as someone who has many other things on their plate, do you dream of getting rich from fiction so that you can spend more time in the absurd? No. You get rich from nonfiction. If I find a new diet I’ll get rich. Sounds like a good plan to me! What happens if Batman gets bitten by a vampire? He can’t sleep upside down. So the question then becomes, where does it sleep. Definitely something we should get sorted from him. While we’re doing that, who shouldn’t people read this book? If you believe politics and morality should be separate, don’t read this. Meet you in Hell (oh, OK, you have to read the book to understand what I mean). To entice our readers to pick up their copy and meet you there, what line from your book can you tempt them with? Hell is where Rap music is pumped in full volume for eternity. *Laughs* I agree with you there! Benjamin, hopefully, we can dodge all of that rap music, and instead, settle into the pages of There Will Be Hell To Pay! Thanks again for sharing this book with us, and I hope to hear more about your latest book release soon! Excited to read the book we discussed today? Find it here on Amazon: ‘There Will Be Hell To Pay ( ASIN: B07KV22GNF )‘. 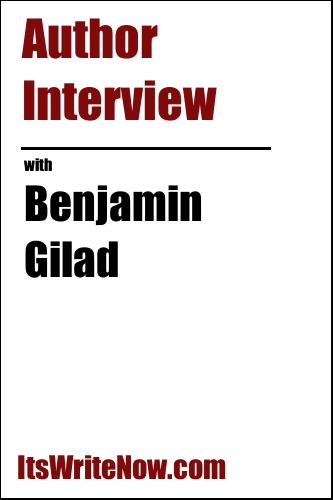 Want to find out more about Benjamin Gilad? Connect here!